With Zoho Survey online survey software businesses can develop focused and valuable web based questionnaires that assist them in obtaining knowledge that will support them making better busienss decisions. Distribute through Zoho email marketing app. Share reporting options for collaborators. SSL security & CAPTCHA security. * denotes that feature is not available with the Zoho Survey Free subscription. Zoho Survey web based survey software supports all your questionnaire, polls and survey requirements by engaging with your prospects and customers anywhere at anytime and by providing you easy to use features that allows you to concentrate on the content and the responses. 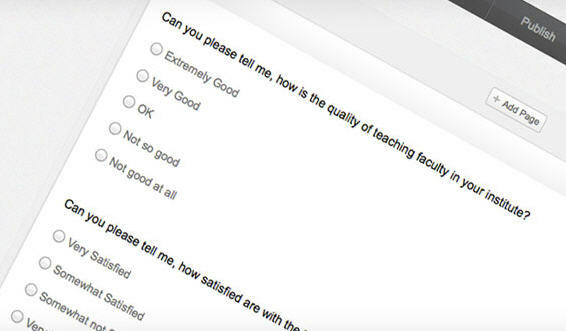 Zoho Survey – optimized for the mobile for quicker survey responses. With Zoho Survey software, internet surveys can be developed to be focused and valuable questionnaires that assist you to obtain knowledge that will support you to make better decisions. 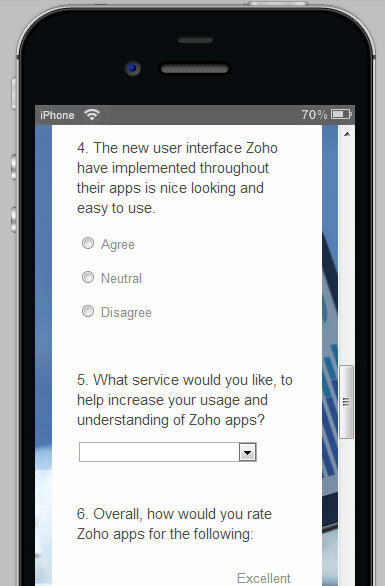 Zoho Survey is automatically optimized for displaying questionnaires on iOS and Android mobile devices, with a custom application developed specifically for the iPad, providing you with a platform to reach your customers any time anywhere. Taking web surveys is simple and much more engaging when moving through questions on your mobile device. Use Zoho Survey at business events for immediate feedback on products, collect lead information at exhibitions. Improve sales processes by providing sales executives with a structured set of open and closed questions. Get immediate responses from training sessions, product launches and Main Street questionnaires. Zoho Survey also comes with several themes so you do not need any coding or HTML knowledge to make fantastic looking surveys. It also has number sample questionnaires for HR, marketing, customer service and other business scenarios in case you need a little help designing your online survey. 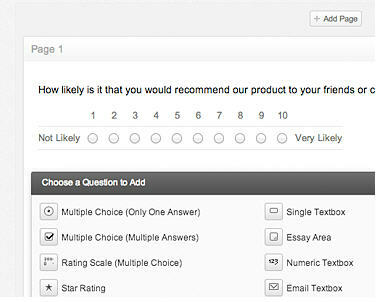 Zoho Survey allows you to create your online survey with a variety of question types such as drop down, bullet points, matrix, ratings and more. Then deploy the web survey on your social channels, embed in your website or send via email campaigns. It even integrates with MailChimp or Zoho Campaigns, the online email marketing solution from Zoho, providing you with a wide variety of channels with which to deploy your survey. Finally, analyse the results of the web survey with the inbuilt reports, including bar graphs and pie charts.